Simple, basic yard art, my favorite kind, can be elevated to a higher level (of what I’m not sure) when it’s referred to as d’Art. I have to admit I borrowed this upscale reference from a friend, Jeff Bagato, who wrote the book Garage d’Art. Anything Easter Island related comes with a built in legend about giant stone heads and the mystery of how they got there. Images of those statues are burnt into my brain. They mystify me and inspire me. They remind me there is still some mystery left in this world. When considering Easter Island, I know there has to be more to it. The local tourist bureau might consider updating and building a newer tourist trap or landmark for the 21st century. In the meantime, I can’t help marveling over anything resembling one of these odd stones especially when I don’t have to travel far to do so. This one in Kenton sits, or stands, at the base of the steps and basks in the shadows. It gives me the feeling of having arrived on the island after many months at sea to commune with primitive art forms, all without having to leave my neighborhood. 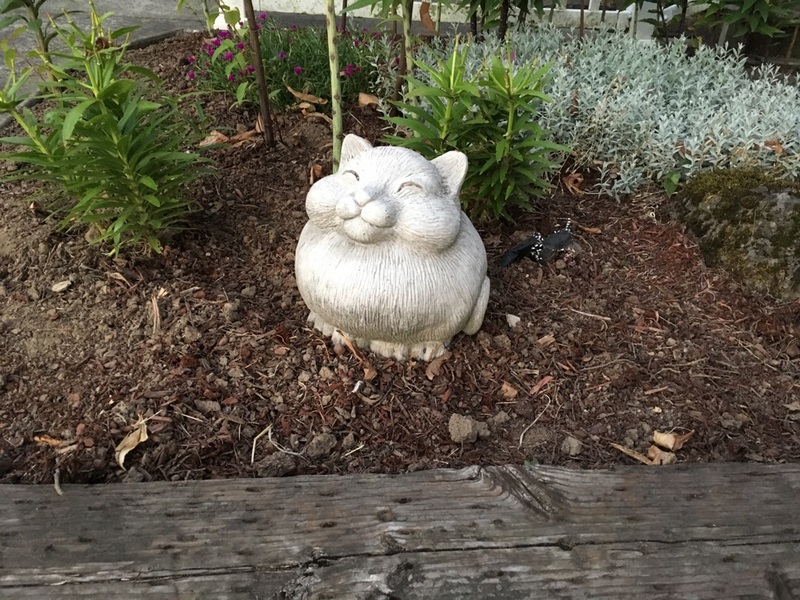 The smiling cat helps me pause and remember to breathe. The cat looks like the happiest, best fed cat I’ve seen in a long time. That smile is contagious. That look of contentment is something that could last a lifetime if the statue receives proper care and nobody drops it. It looks like a Buddha parody or an actual Buddha for the feline set. I’ll have to ask a Buddhist cat. 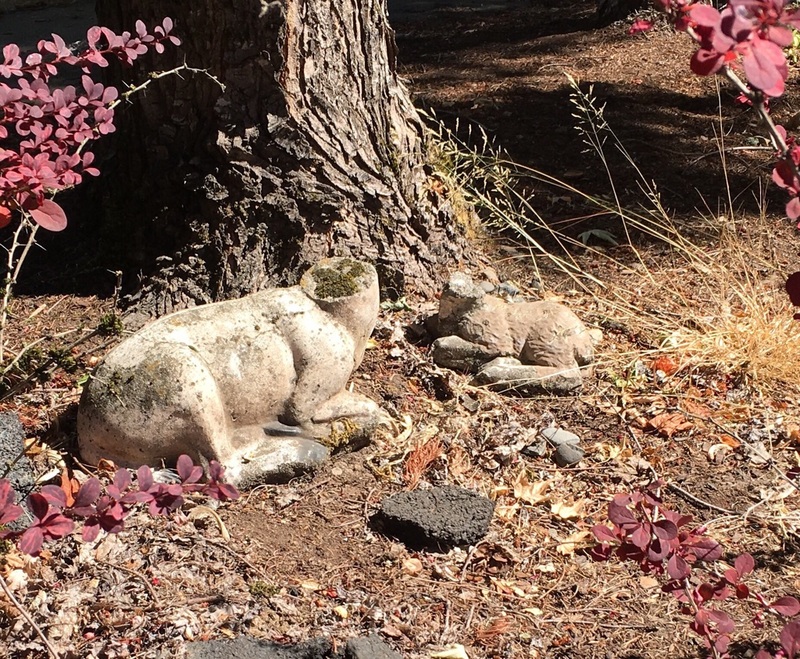 A sheep and a lamb lie down together in peaceful bliss on the grounds of a Lutheran church in northeast Portland. They remain there, in the elements, steadfast and stoic despite their heads having fallen off. How do stone heads even fall off? My mind immediately flashes to some troubled teens vandalizing sacred symbols on church grounds, but I continue to this day to believe their heads wore out and crumbled off their scrawny necks. It makes more sense to replace these symbols of Christ’s love and bucolic barnyard beauty with some fresher statuary especially now that they’ve been lovingly mocked in the pages of some random blog. This duck is a classic. He has an antique look. If he’s a drake then he has awesome guyliner. I guess mascara is more expected on lady ducks. 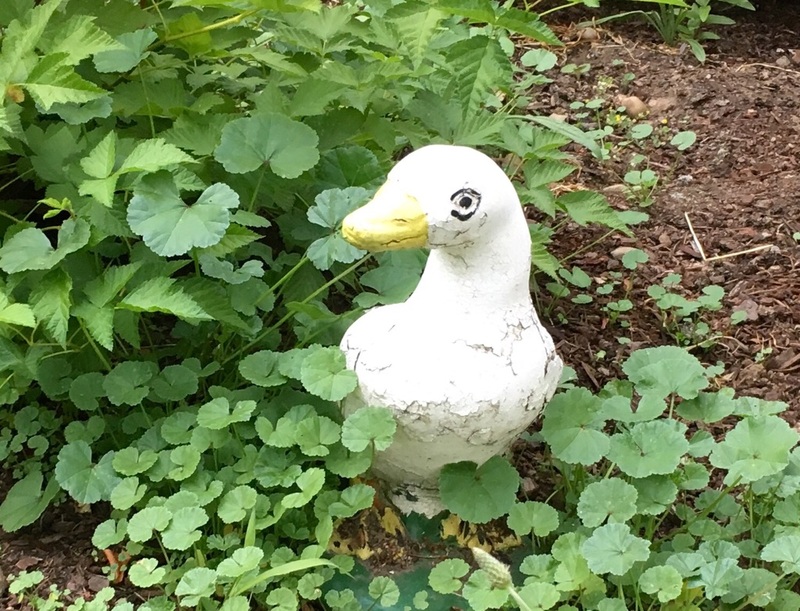 This duck is covered a bit in an ivy and clover mix. I like how he’s having a look around and trying, despite his short neck, to get his bearings. He has a unique, individually crafted look about him with his crackled skin and quiet demeanor. Waddle on my friend, but don’t ever waddle too far from this serene setting. 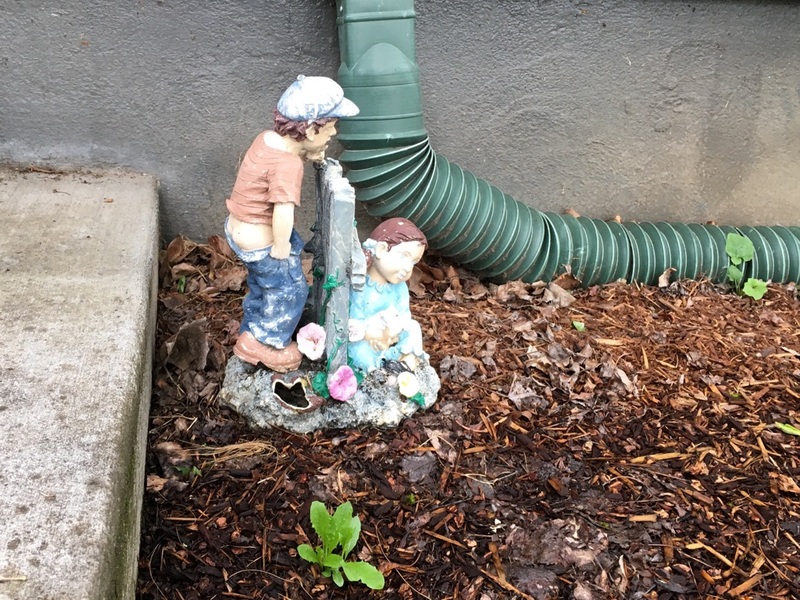 Here we have two lawn figurines placed together to create a story. I was struck by the unfolding drama. We are freeze framed in a moment, the exact fraction of a second that a bear has wandered up behind Snow White in one of her typical magical trances while spreading her joyous love and affection toward a sweet, tame song bird. Perhaps they are cheerfully engaged in song. Your mind may have created a different scenario. These lawn ornaments allow us to consider an interaction that will never actually happen. Is the bear a friend of Snow White? Can her charms work on this ferocious beast so she can avoid being mauled? Will the bear sneak up on this unsuspecting sweet soul and eat her before she even knows what happened? You’re welcome to your own story if I haven’t covered all the bases. We’ll never really know because we’re dealing with the infinite and frozen-in-time aspect of lawn ornament arrangement. I spotted this proud specimen in southwest but he or she could be anywhere demonstrating his or her pride and grace. If this statue were in West Linn, I imagine, it would be a hundred times bigger. I like that it’s small and subtle and caps off a well designed front landscape and porch steps. The Unicorn’s horn isn’t even gold. I’m a stickler for that for some reason. Upon closer inspection it’s off white. 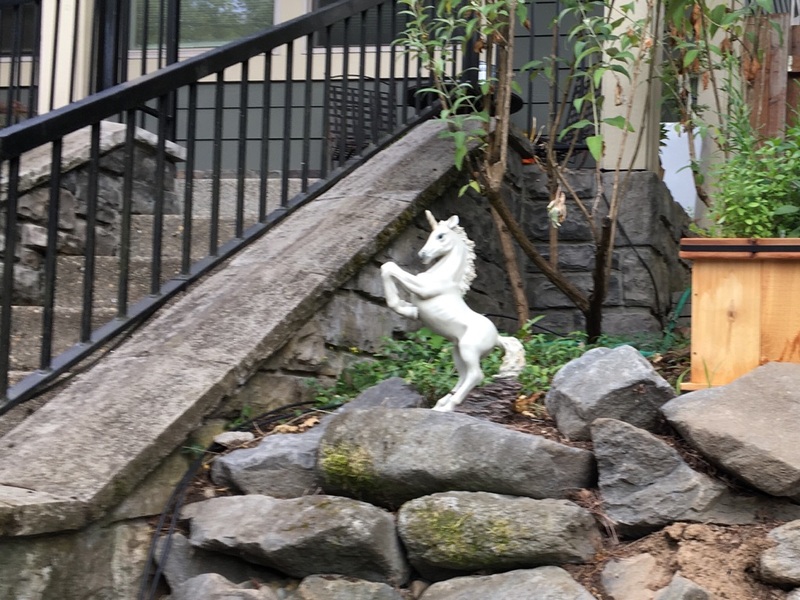 Such a minute detail might detract from the overall concept which is simple: a dainty, all white unicorn stands atop a rock pile. It makes me wonder who put the corn in Unicorn? This may be the reason I think all unicorn horns should be gold or yellow. This set-up looks like something from the pages of Better Homes and Gardens. 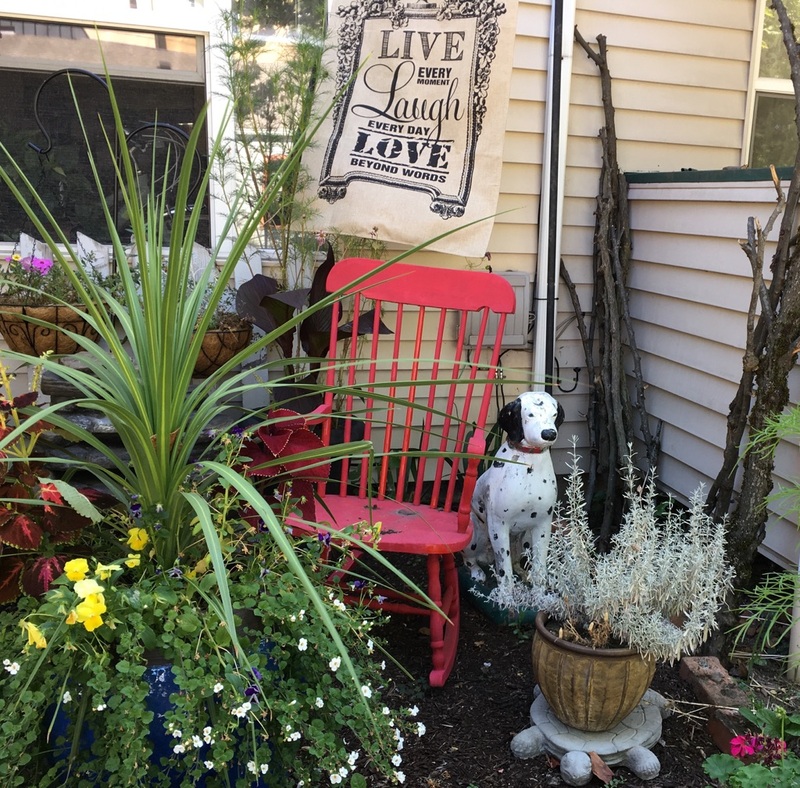 Maybe my photo isn’t magazine-ready, but it captures my impression of this side yard outdoor reading nook on N. Williams Ave. 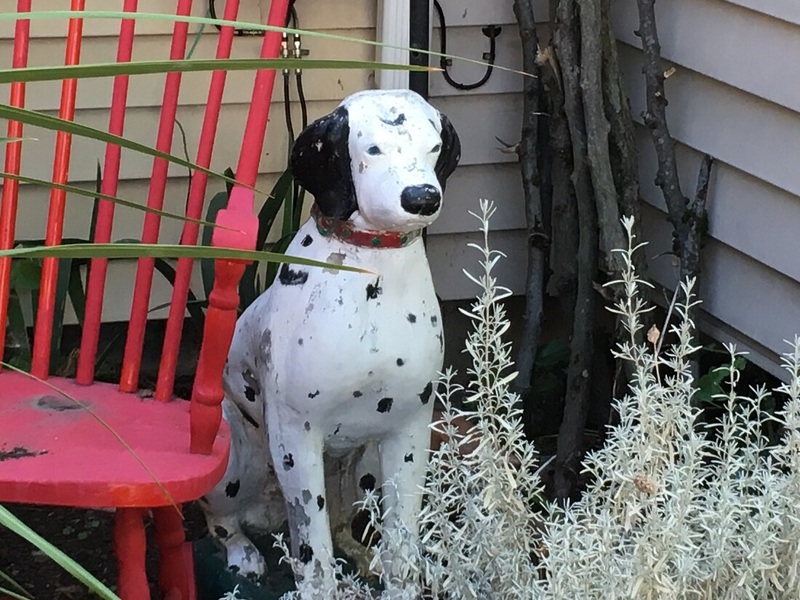 The burst of red from the chair, the plantings and flattened turtle plant stand along with the faithful, oversized antique dog figurine all combine in a fit of savvy decorating and create an inviting place to lounge with a dog statue. The dog is chipping and peeling in a way that fits his breed. You know, Dalmatians are already spotty. It’s another case of something becoming more interesting to look at as it ages. We find this patient companion on the verge of bursting into fits of joy when his owner arrives. Sometimes you end up wondering about what people place in their yards. 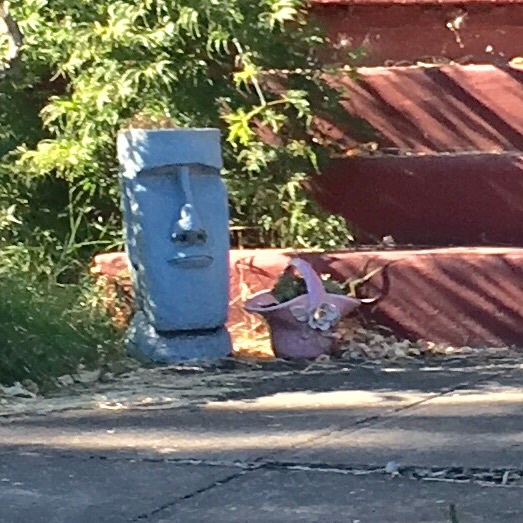 Yard art will always entertain me, but some objects also make me scratch my head. The first is kind of a standard. I’ve seen a few and get the sense it’s a good natured commentary about a woman bending over, maybe to do some gardening, and then whoops! bloomers are showing. 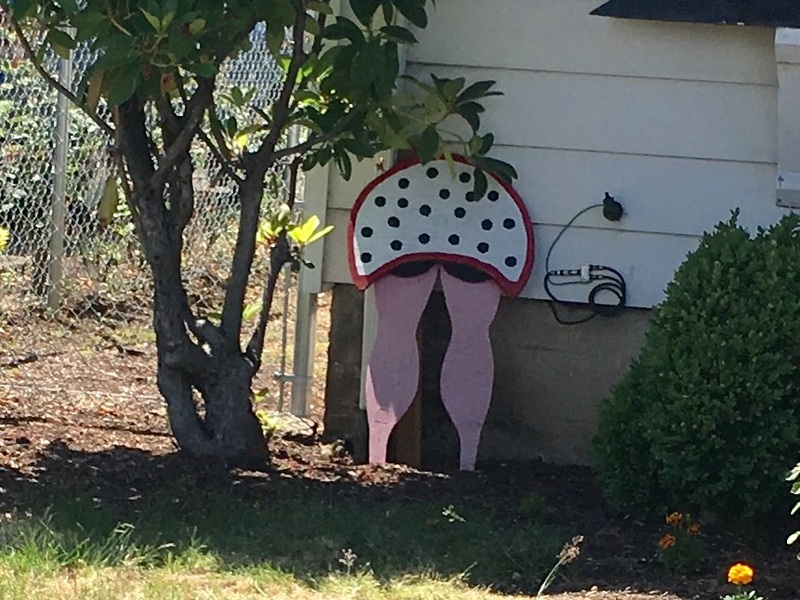 Real bloomers might be embarrassing, but wooden, painted ones, well, not so much. This statue needs to remain an unsolved mystery. From a distance and up close, I’m still not sure what’s going on, and I don’t want to know. I was wary of taking this picture because I felt like I was sneaking onto my neighbor’s yard (or it was sneaking into me). I made sure no one was home. How could I explain my interest in their yard d’Art? Or worse yet what kind of conversation would or could we have had about the piece? 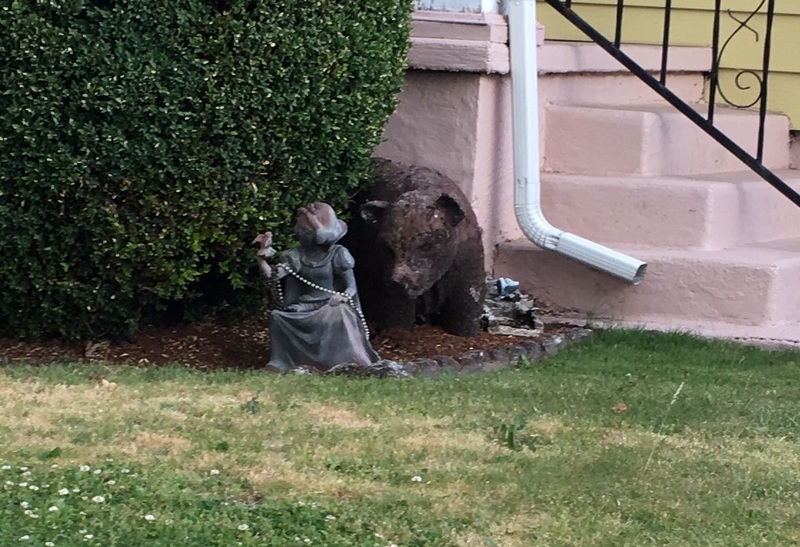 They moved not too long ago taking their yard ornament with them. Thank goodness! It was in the FRONT yard. A passerby cannot help but see this boy has his pants down while peering over at the girl who seems unaware. There’s a fence between them, so I’m not sure what he thinks she’s going to see. Already, this analysis has gone too deep and we are uncomfortable. I’ve said too much. You’re on your own to consider any further interpretation. I can think no longer about this statuette. *Yes, that was a Big Lebowski reference but something tells me I needed to tweak the phraseology a bit more to appease the achievers out there. Having watched the Big Lebowski this summer at a fake drive-in movie set up at the Expo Center, I gained an appreciation for the cult like aspects of the movie created by rabid fandom. Borrowing a line from that film feels like a given when writing about how one item of lawn art can make or break an exterior space. **A shout out to neighbor Graham Marks for posting a picture of Keith on Instagram and making me aware of his existence. I eventually tracked Keith down and caught him in the act again! That second to last made no sense. I felt weird even looking at it.